The lawyer for Yulia Tymoshenko says the former Ukrainian Prime Minister has gone on hunger strike in protest at the situation in the country and against her own treatment while in prison. It’s unclear whether the politician is protesting against her forced trip to a hospital, or physical abuse, allegations of which have been officially filed by her lawyer. The European Commision has demanded an "immediate explanation” from the Ukrainian authorities regarding the situation. 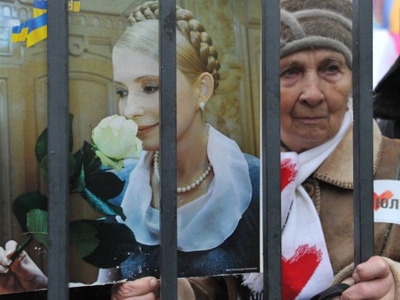 It also called on Kiev to grant Tymoshenko’s lawyers access to the ex-PM without delay. Tymoshenko is in a prison in Kharkov, and last Friday was taken to a clinic in the city, but was returned to jail a day later after refusing treatment.Her lawyer Sergey Vlasenko said prison officials kicked Tymoshenko in the stomach while taking her to the hospital by force. Prison officials deny the allegations, saying they were only present as a convoy and that the actual transportation was done by medical staff. They did confirm the country’s former Prime Minister was forcibly taken to the hospital – but only because she refused to go at the last minute. The region’s prosecutor Gennady Tyurin told reporters that just before she was due to head for the clinic, Tymoshenko “packed, got dressed – and then laid down on the bed and said 'I’m not going anywhere'”. The official went on to explain that legally, “the prison service has the right to use physical measures: she was picked up, carried to the car and taken to the hospital”. 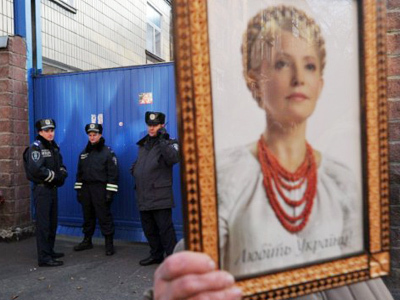 Upon arrival at the clinic, Yulia Tymoshenko refused medical assistance – or even an examination by staff saying she didn’t trust the government appointed doctors. 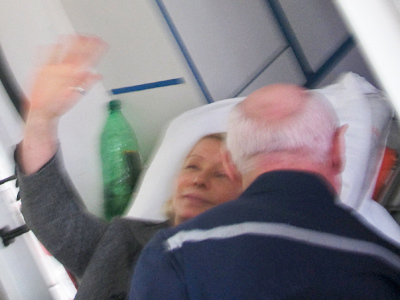 Some reports quoted medical staff from the clinic saying they didn’t notice any signs of physical abuse on Tymoshenko, such as bruises or scars – but were careful to point out they only saw her hands and face. Her lawyer, however, insisted that he was denied access to his client precisely because of visible evidence of abuse – like “huge bruises on her arms”. He also claimed that Tymoshenko did not refuse medical treatment – and had, in fact, requested it. Vlasenko said that as a result, his client has been refusing to eat for the last few days. The ‘he-said-she-said’ situation has been escalating for weeks. Ukraine’s former Prime Minister was sentenced to seven years in prison for abuse of power, is reportedly suffering from a serious spinal condition, and has frequently requested outside medical assessment.A team of German doctors visited Tymoshenko and did a full medical evaluation. Their report is expected to be published soon. There have also been frequent allegations of mistreatment and various rights violations, all of which have been vehemently denied by officials connected to the case.